Indian Accent; Very very Indian, very very cool! Arguably India's best restaurant, Indian Accent has been getting better in the Asia's Top 50 restaurant list and as of 2017, is ranked 30. 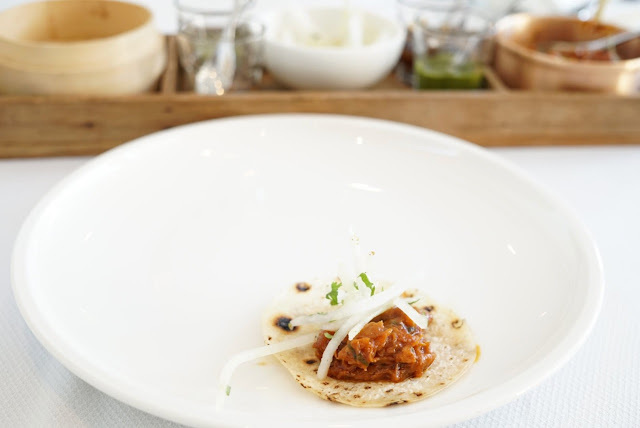 Ranking or not, Manish Mehrotra is considered the father of modern Indian cuisine by many, including top chefs and it has been a foodie dream to dine there. The executive chef, Mr. Shantanu Mehrotra's interaction and his insights into food (and life) are an added perk. Being in a hurry is no way to experience Indian Accent, but a preponed meeting left me with just an hour or so to savour this and destroyed any chance of trying the chef's menu. However, the waiter made sure that I got as close as I probably can with a careful selection and a clever mix of complimentary amuse bouche and palate cleansers. After a good round up of the menu, the waiter suggested I get the potato sphere chaat, the ghee roast mutton boti, a chur chur paratha and dessert. 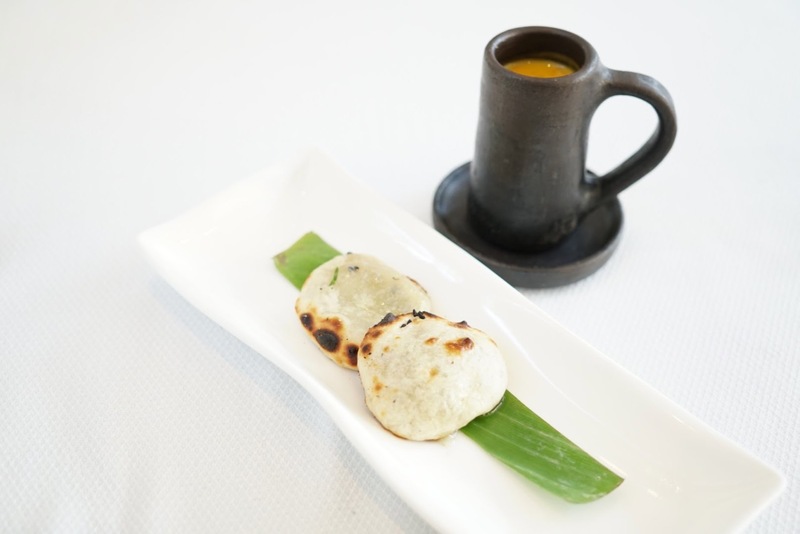 Long before these came, a stunning little plate with two tiny naans, their signature blue cheese naan arrived as the amuse bouche. Tiny as it was, it packed the flavour intensity of a standard naan. Make that, two standard sized naans. 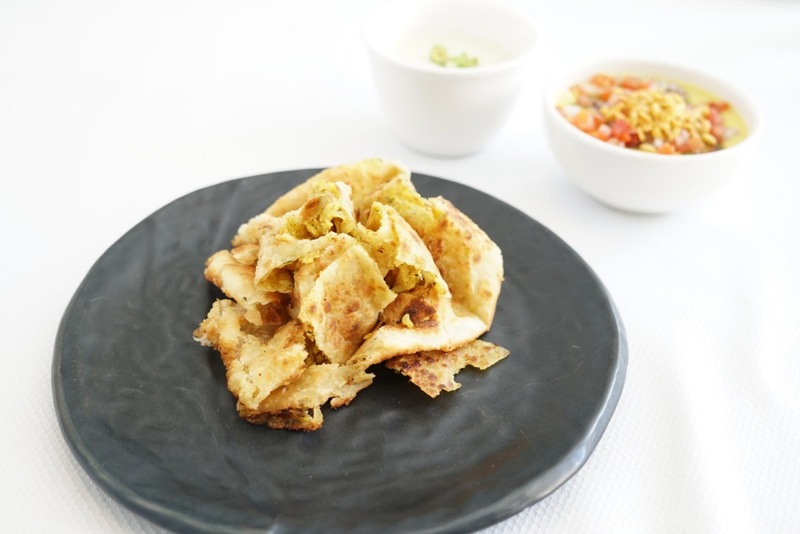 The naans had no trace of the stringy blue cheese outside, since it was carefully packed, thus delivering the blow as you bite and tear into the naan in your mouth. To wash it off, chef also offered a pumpkin soup. Again, a tiny morsel packing all things required. 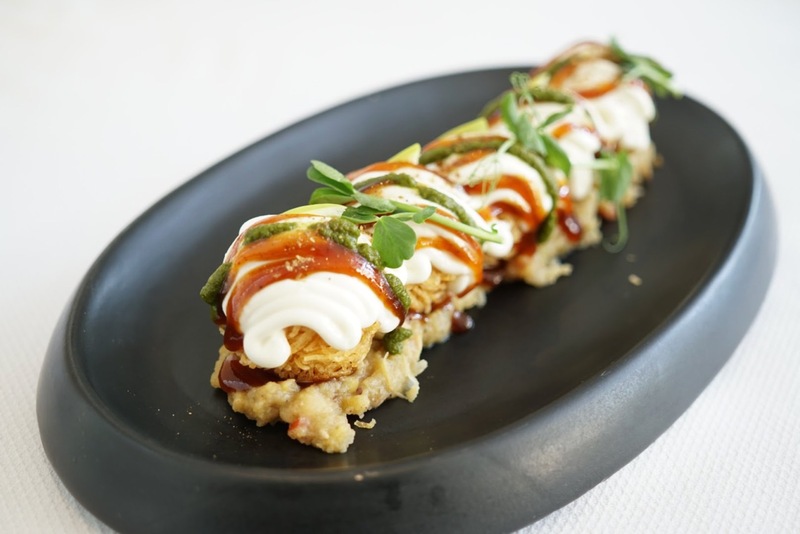 Then arrived the potato sphere chaat. Crispy balls stuffed on a bed of mashed potato with white pea ragda and all your chaat flavours, gulping down all six is no difficult task. The crunch from the crispy spheres was the perfect folly for the mashed up potatoes. So yummy, that polishing off all six was not difficult at all. The dish of the day arrived. When a single dish requires a platter to serve, my guard was up for the theatre. There was none. All the theatrics were your own. A beautifully curried lamb boti served with 4 chutneys, some onions and small romali roti's, you could say that the theatrics was in the dish and not outside it. With four chutneys to top off, every romali roti that you place the boti on with the onions, you almost get four dishes, my favourite being the powerful mushroom chutney. The meat itself was melt in your mouth and needed no extra effort from the mouth and therefore, the full dish can be eaten by one person. 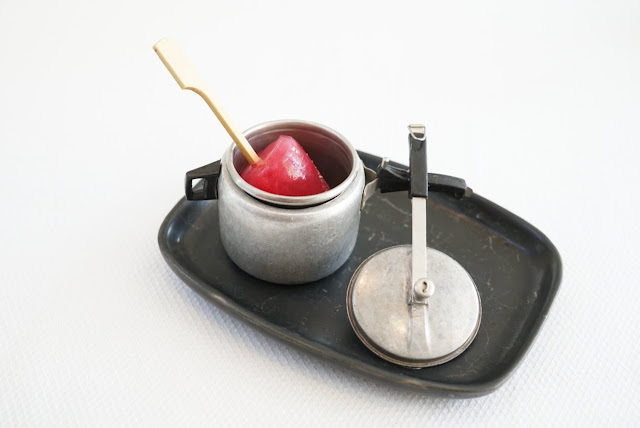 Next to arrive was the raspberry sorbet, a simple but effective palate cleanser which doubled up as a stomach coolant after the ghee heavy mutton boti. 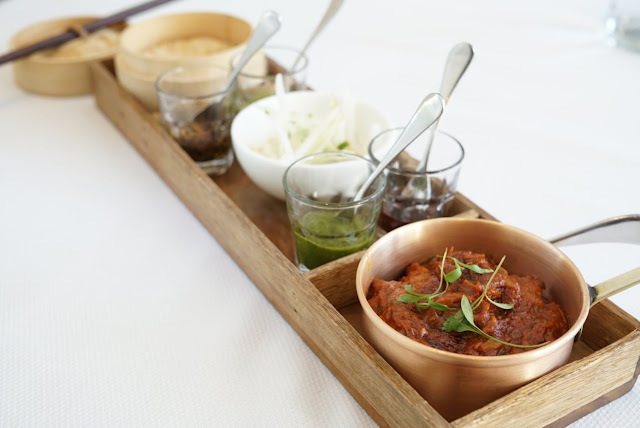 The cauliflower chur chur was served with their dal moradabadi and the chestnut wasabi raita. The parathas were so soft parathas, they can give stiff competition to well made idlies! Comparing it to butter will be an overkill though. I was told that the Daulat ki Chaat with almonds and rose petals is THE dessert to try here and I didn't resist. Served with fake 500 rupee notes that I have no idea what they're doing there, the saffron cream with its rich rose petal chikki and almonds can be a handful for one person. Since the food is so well done, it takes a while before you realise that you've eaten a lot. While an order like this does give you about 7 dishes to try for about Rs. 4000, taking the chef's 7 course meal would be a great way to spend the same 4k! The service and the knowledge the waiters have about the food served is on par with Asia's Top restaurants. 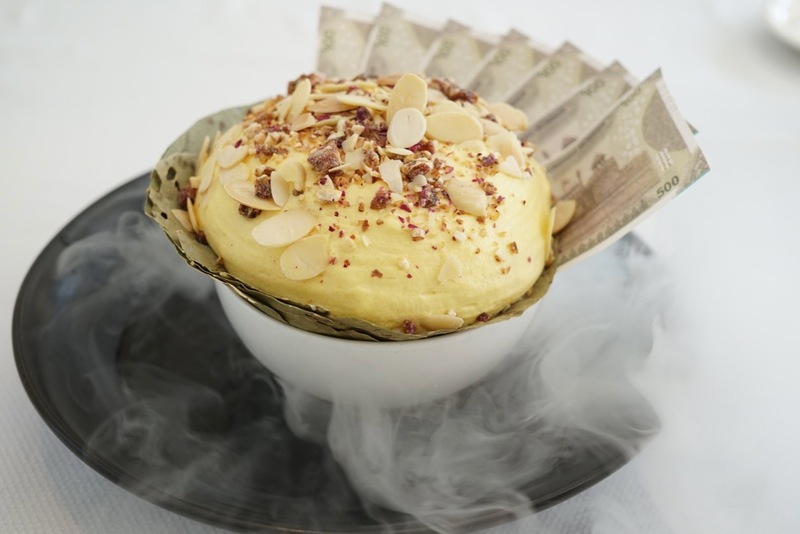 Indian Accent is now located at The Lodhi, New Delhi and should be a must do in any foodie's list. After all, for all practical purposes, it is India's No 1 restaurant. Chennai Foody: Indian Accent; Very very Indian, very very cool!